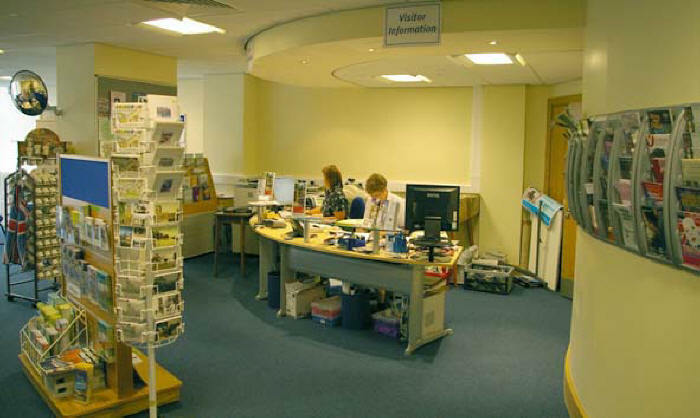 The new visitor information area in Nantwich Civic Hall. I MUST admit that I have mixed feelings about the move by Nantwich Tourist Information Centre from their ideally-central position on Nantwich Square (pictured below) to a part of the Civic Hall about three hundred or so yards away in Market Street (also below). Sometimes I think it is the worst thing they ever did, other times I think it will not be so bad - once everyone has got used to it. On those days I think: Does the building have to be in the centre of town when visitors are not beamed down there on the lines of Star Trek, but actually drive into Nantwich from outside and park in one of the car parks, or alight at the bus station or railway station - all still within the town centre. In fact, visitors arriving by bus or from the north or north west - from whence many on the tourist circuit arrive from Chester - are ideally placed to get instant information as they are already in Market Street or on the Civic Hall car park. Of course, visitors arriving by train, or from the east and south and parking their car on that side of town, now have twice as far to walk as they did before. But I wonder how many people going to any town or city expect the first building they reach to be the Tourist Information Centre, from whichever direction they arrive? Let me pause there to mention one thing that did make me chuckle. 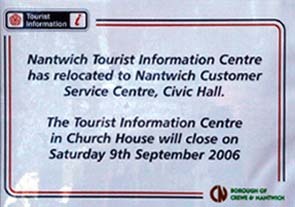 It is no longer called the Tourist Information Centre! The powers-that-be have, in their wisdom, decided that it should now be Visitor Information - inside the Civic Hall, at any rate. (But that might because other council departments are in the same area.) The sign outside the hall is the one from Church Walk. As one of the ladies behind the desk explained: "You can be a visitor without being a tourist". True, but I am a local without being either a tourist or a visitor and I use the place and surely Tourist Information Centre is what everyone knows these places as. There's always someone who has to change things . . . ! "There was no publicity about the move," some people have said. I e-mailed Elaine Dodd, the Nantwich Town Centre Manager, the other day - about something else - and mentioned the problems the move had caused. She replied: "Yes, it will take time for the TIC to become recognised in its new location. The Manager there is working also on replacement signage and I have arranged the finger posts to be altered. Also, I am including items into any marketing material I produce as appropriate. That, presumably, is the new signage (what's wrong with "sign"?!) above right. Finger posts correctly aligned will help, too. But until visitors find the Visitor Information Centre and pick up leaflets, how will they know where to find the Visitor . . .? Presumably Elaine is talking about leaflets sent to other areas and the CNBC website (even though that was still referring to the TIC as being in Church Walk for a while after they moved!) Actually, the local press carried reports about the progress of the building work, and the Civic Hall was boarded up for a couple of months. Also, several copies of the poster (centre) were put up on the front of the building in the days before the staff left and they were still there afterwards. I heard that one man turned up at the theatre and, finding some members busy preparing for the next production, said: "I can't find the Tourist Information Centre. Can I buy production tickets here?" Sorry, no, was the reply. If only he had known. The Civic Hall is the same distance from Church Walk as the theatre is from the old TIC office - only in the opposite direction. Maybe it will be easier next time for him and everyone else. However, see the panel below about TIC opening times. l DESPITE the earlier confusion, Nantwich Players had sold all their tickets - for the whole week - by the time the play opened. Patrons had been able to find the "box office" after all. 2015 UPDATE: Nantwich Players' tickets are now booked both at the Civic Hall and on-line via the Town Council's tickets facility. (See What's On). Borough Council (CNBC) who run the information service, along with the one in Crewe. My initial impression of the new "home" of the information people was that it didn't seem to contain as much information as the old place in Church Walk, which seemed to be bursting at the seams with leaflets, booklets and videos. Of course, it was early days when I called in at the Civic Hall and maybe the leaflets, etc, will build up in time. One point, the space for displaying posters about forthcoming events by local groups is not as large as that in Church Walk which was virtually the whole of the entrance foyer. Visitors want to know about local events during their stay, you know! I also think the Civic Hall information area is a little smaller than the space they had in the other building. Not that I measured either. 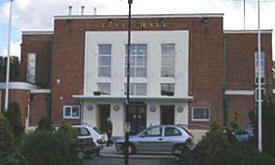 In the Civic Hall, the helpful team are situated between the borough council's Nantwich Office (whose staff collect payments for the CNBC or give advice, etc) and the entrance lobby to the Civic Hall main's hall used for dancing, concerts, etc. 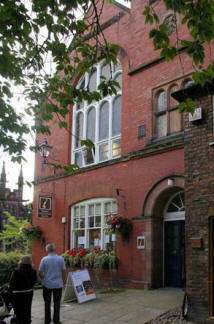 One of my interests is Nantwich Players who use the Tourist Information Centre for the booking of tickets for our productions - our box office. All very convenient when the members couldn't staff a similar full-time service at the theatre itself. But we have heard of patrons having difficulty finding our tickets. Yes, they know where the Civic Hall is - they are locals, after all - but many people don't seem to have realised the TIC have moved there. The Spring 2006 edition of "News and Views" (the newspaper of Crewe and Nantwich Borough Council) said: "The first (one-stop shop) will open at Nantwich Civic Hall later this year . . . "
It will "open six days a week, plus one late night opening and Sunday opening when there are special events in the town." But the newspaper added: "Opening times will be reviewed after 12 months in response to customer feedback and as the service expands to incorporate that of local organisations, making it an even more useful facility for local people."